Taylor's Sweet Little Art and Nerd Site: Sketch Card of the Day- Rattlor! Today's deviation is Rattlor! Rattlor is the "general" of the snake men. He would be in second command of all snake men right behind King Hsss. One of the things that I liked about Rattlor is that he is the only snake man that is red. The vintage figure has the rattle feature with him. Just shake him and his enemies will be weary. His other action feature is his striking neck. Now I'm going to let his super long neck slide unlike Mekeneck's due to the fact that nature made him this way. So, you would push a button on this back and his neck would shoot out of his body and stop to look as though the neck grew to strike out at an enemy! It sounds kind of silly, but it is very effective! I have a vintage figure that I was showing my best friend's kid, and she initially jumped. Then she would make the snake hissing noise before the neck would shoot out! Now the 200X version did the same. But, I don't have one of the 200X version. They were short lived and hard to find. I am keeping my figures crossed to find one of the 200x Rattlor and Kobra Khan, but I'm not holding my breath. 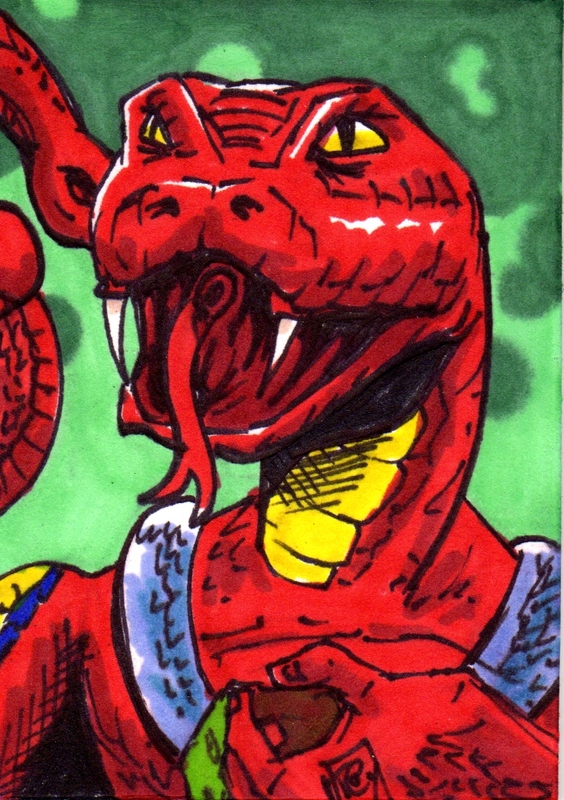 This sketch card is based on the vintage figure's look, but with the 200X chest armor. You can also see this sketch card here.